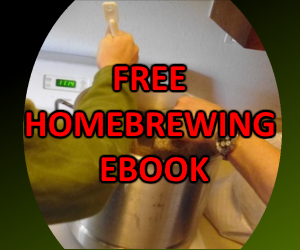 The recipe linked above is scaled for 5 gallons. For my batch, I'm going with two gallons. This was going to be an expensive batch, as wildflower honey and pure maple syrup are both pretty expensive. 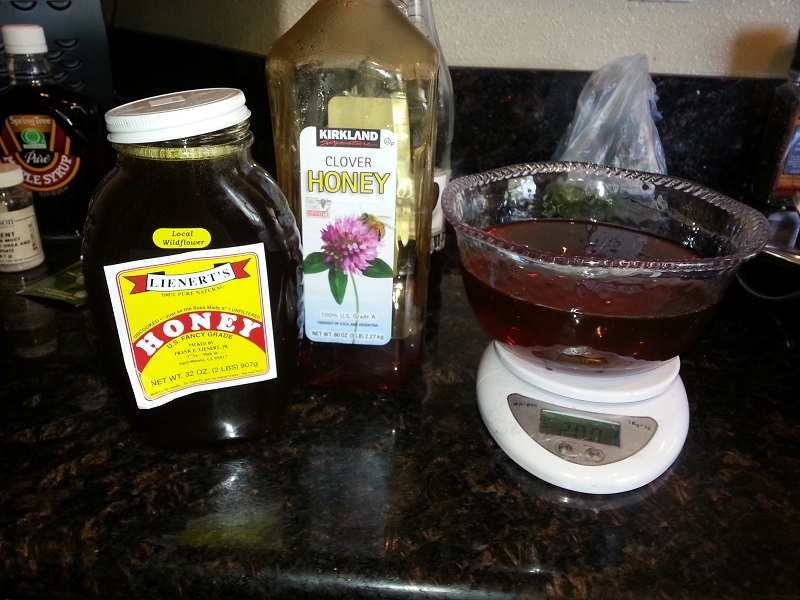 I still had some clover honey leftover from making "916", so I decided that half the honey would be wildflower honey while the other half would be clover honey. I was able to source some local Wildflower honey at a nearby natural foods coop. They had a pretty wide selection of honey from other plant sources, so it's worth looking into for future mead batches. Can't overdo it on the Clover honey now! There are two different grades of Maple Syrup; Grade A Maple Syrup, which is the stuff you put on your pancakes and waffles, and Grade B Maple Syrup, which is food processing grade. It isn't easy to locate Grade B syrup on a grocery store shelf, but the local coop also had that available. A little taste test revealed how much richer it was compared to normal Grade A or imitation syrup. To make this batch, I took 2 gallons of water and heated it up a bit. I carefully added in the honey first to ensure that it would not conglomerate on the bottom of my kettle and while I was still heating. 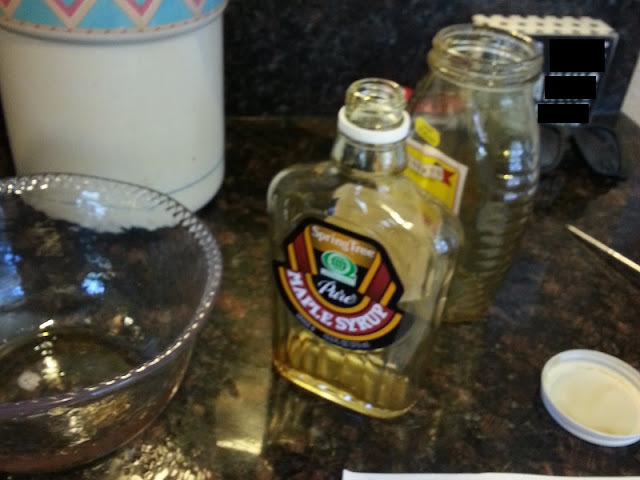 Next came the maple syrup, which was much less viscous than the honey. I'll call it "Canadian Sunrise"
After heating for a bit (not to boiling temperature), the "must" was transferred to my fermenter, where the volume took up only half of the bucket. This is fine for now though, as the yeast requires a lot of oxygen to ferment all the sugars in the honey. In less than a month time, the fermenter will be racked into glass carboys for aging. There should be little risk of oxygen spoiling the brew in that time frame. 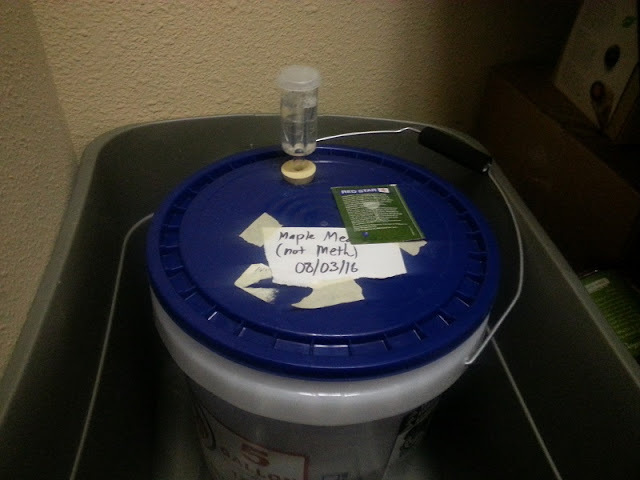 The initial gravity on this mead came out to 1.077. I was expecting this number to be a lot higher, but compared to my first batch of mead, which had an OG of 1.125, the honey to water ratio is a bit lower. This brew is 2 lb/gallon, while the other was at 3.5lb/gallon. If this is able to ferment down to dryness, then I would expect this brew to break the 10% ABV mark. It's likely this will occur since there is a second maple syrup addition two weeks into fermentation. So once the yeast gets pitched, this brew has some interesting additions following that. 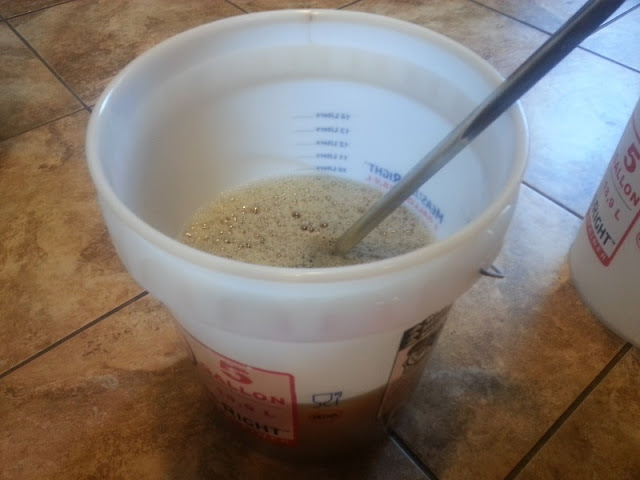 On day 3 and day 6 of fermentation, ~1 tsp of yeast nutrient gets added to the must and aerated. 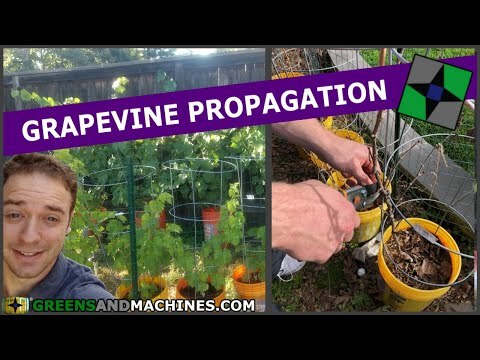 Now when I did this, the moment the nutrient hit the must, it really started foaming up! Aerating it also brought up some foam, likely from the CO2 dissolved. I would be worried if I didn't have as much headspace as I do now with the fermenters. The only issue I have is always the danger of introducing some bug or another. But since this fermentation takes a while, and the honey likely contains a bunch of bacteria already, I don't think I have much to worry about as the alcohol concentration climbs. At the time of writing, this brew is now two weeks into fermentation. 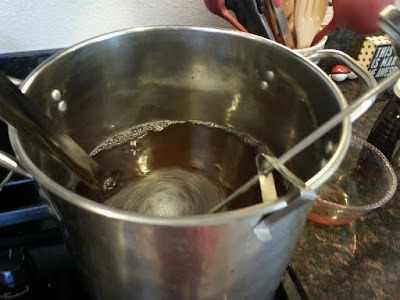 At the start of the second week, a second addition of maple syrup is added. For my scale, that would be 13 oz. That went in without any issue. Now the yeast will get back to work. After I allow it to ferment another week, the batch will be racked into glass carboys. 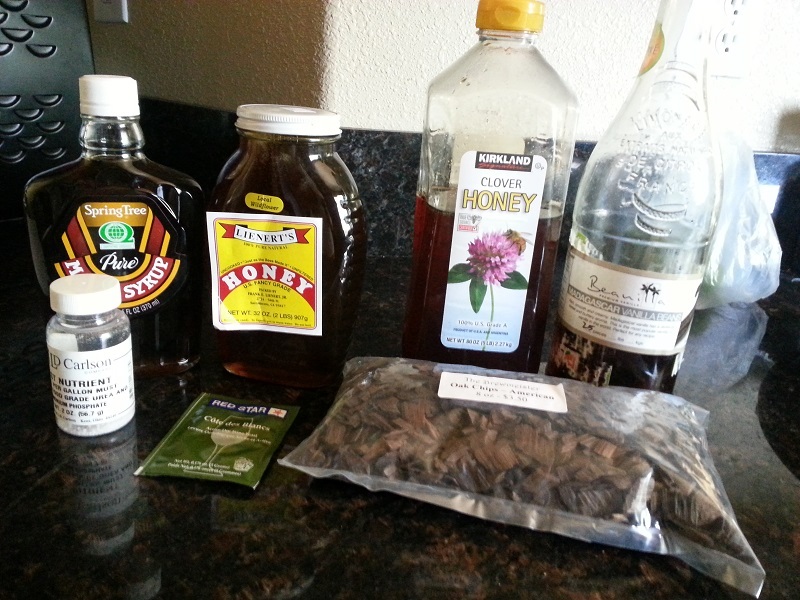 I will be adding 2 oz of oak chips to the brew along with two teaspoons of vanilla extract. I'm anxious to see how the oak will impact the flavor. After a month of oaking, the brew will be racked again and aged for 3 months. Following the three months (early December for me), it will be time to bottle this. 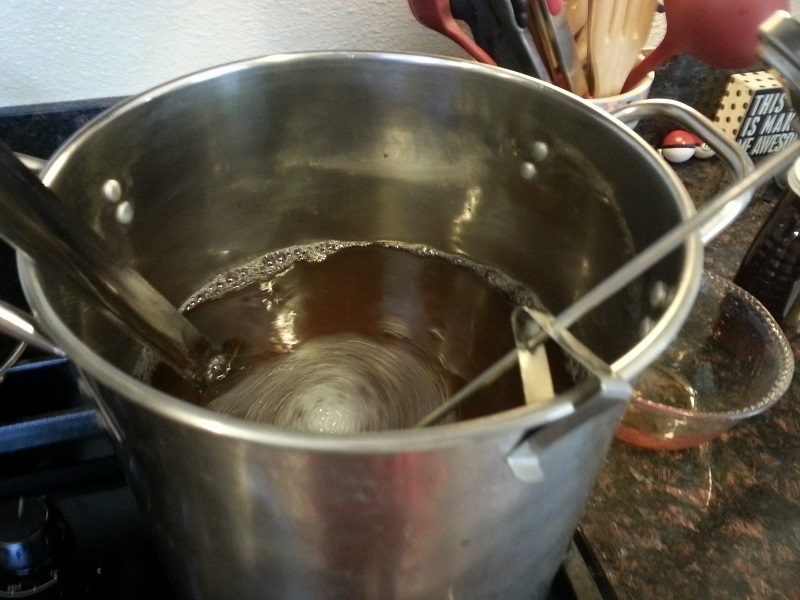 The recipe calls for carbonating the mead. Based on the availability of beer bottles or swig top bottles, I may choose to not carbonate some of this batch. That'll be a production decision closer to that time. The mead is supposed to age for another 4 months following that. My likely choice is to carbonate half of it, aging 1/4 of it uncarbonated, and begin drinking the other 1/4 of the brew in time for the winter holidays. This mead is starting to shape up, and I'm betting that the high cost will be well worth the investment. Until then, Cheers!